Houston 3-1-1 Help and Info - Why Was My Service Request Closed? > Houston 3-1-1 > Why Was My Service Request Closed? Why Was My Service Request Closed? (1) The work is complete. (2) An inspector was unable to confirm the problem, or determined that the problem is within tolerances. (3) The Service Request was Closed and another, more appropriate, Service Request was Opened. (4) The Service Request was referred to an outside agency, such as ATT, CenterPoint Energy, Harris County, TXDoT, etc. (5) The Service Request is a duplicate. Someone else has reported the problem. 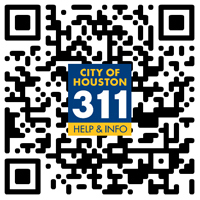 Please visit the 311 website at Houston311.org and enter the address in the .Find Address or Cases. box in the Service Request Map. For the best way to see what the City is doing in your neighborhood, please visit the 311 website: www.Houston311.org. The case map on the first page shows most of the Open Service Requests (Red dots) as well as those that have been closed within the last 7 days (Blue dots). You can zoom in to your neighborhood or enter an address in the map's search box, then click on any dot (Red or Blue dot) and view details, including any action taken so far by the City. For live assistance including TTY callers, dial 311. Some mobile phone users or persons outside the Houston area may need to dial 713.837.0311.